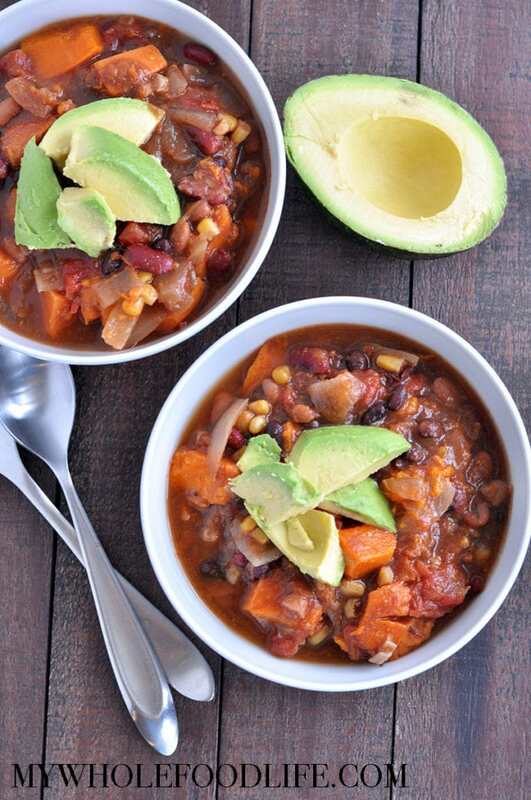 This Sweet Potato Chili recipe is fantastic! I cannot take credit though. My husband Marcus created it. He is the chili guy in the family. Actually, up until recently, he was the cook too! I have learned a great deal from him. 🙂 Also, I should mention, this sweet potato chili is super easy to make. You just throw everything in a pot and cook. It would probably be extra good slow cooked in the crock pot. We brought this healthy chili to a family member’s house on Thanksgiving. Everyone that tried it, loved it. This recipe also makes a large amount so you can freeze some for those busy days. I freeze it in serving sized containers. We just added an updated video for this recipe. You can view it below. For more videos, you can subscribe to my You Tube channel. We use dried beans and just soak them overnight. Boil them for about 10 minutes in the morning. Makes for a much cleaner taste. Take all the ingredients and throw them in a large pot. Cook on high for about 3 hours covered stirring every once in a while. For the last 1/2 hour cook uncovered and you can also add about a T of flour to thicken the sauce if needed. We used brown rice flour. This makes a ton of chili. If you don’t eat it all, it should freeze nicely and then you will have a backup meal for a day when you don’t feel like cooking. This came out so well that we are probably going to make this for our family thanksgiving meal. After all, we are the weird vegans of the family. is that 2 cups of each type of beans after soaking? I think they almost double in size don't they? Maybe a stupid qquestion but anyway; can I boil the deífferent beans together, after soaking, or od I need to boil them separately ? The recipe sounds deliscious <3 I'll try it tomorrow. Hi! I have made this once before and it was delicious.It is perfect for my weight watchers. How many servings would you say in the recipe? Also, how would I make this in the instapot? Thank you for your help! Hi Melissa, One question about the salt: I thought that you shouldn't use salt with dried beans because they will never become soft. That happened to me once too. But in your video I see that you add salt and you are using dried soaked beans in the recipe. Could you enlighten me on this? And also about tomatoes: I also read that tomatoes with their acidity makes beans harder to cook. What are your thoughts?